As has been widely noted, elephant poaching in Africa has risen to very high levels- and once again is, threatening many populations of elephants. The debate over the causes has not been entirely settled. Some have advocated that this increase is a result of surging demand in East Asia (chiefly China). As an explanation it doesn’t match a lot of what we have learned about this latest upsurge. One credible cause of poaching is civil wars (and other collapses of civil order). Expenditures on parks and reserves takes a major hit, whilst desperate people seek food and livelihoods from these reserves. And armed gangs try to cash in on what is there to fund more bullets and bombs to fuel the conflict. The striking thing about the poaching upsurge is it is not uniform. It is in fact, heavily concentrated in the Central African range states. According to the IUCN elephant summit held in Botswana in December last year, it is running at around twice as high in the central African range states as the rest of Africa . 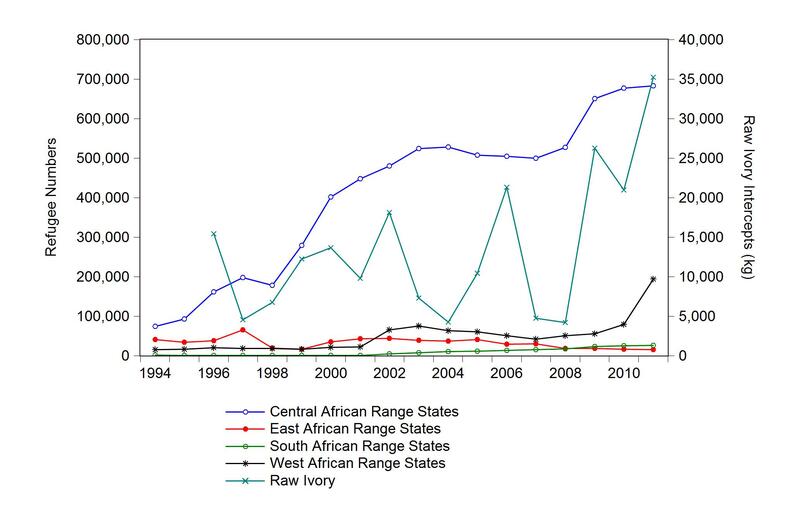 This is one of the clues we have, that the upsurge in poaching is a supply-driven event. This can be shown a little more graphically. How can we measure the ‘level’ of conflict in each of the range states? Well, one way to do it is with refugees. These are genuine refugees, rather than ‘economic’, and for humanitarian reasons, numbers are collected by the UN. If conflicts increase, then people tend to try to escape. They become refugees. And they do so with some alacrity. It’s a pretty sensitive indicator. So let’s look at the refugee numbers and the raw ivory intercepts. Raw ivory becomes the indicator for poaching. I’ve dropped the worked ivory out, because it is smuggled, raw ivory that is the chief export from range states. The first thing that is really obvious is that refugee numbers in Central African range states completely dominate the rest of Africa. What can also bee seen, is that from the late 1990s to early 2000s, refugee numbers and poaching levels rose- then they seem stable up to around the 2008-09 period, and then they both take off again. This tragically, describes a case of almost heavy cropping of elephants in this Central African region. Which raises the next big question. What happens when these armed groups killing elephants run out in that region? Will the poaching crisis burn out with the decimation of these elephants? Or will they move to other regions of Africa. We saw something very similar with Kenya. It seems that if you want to limit losses to poachers, the first thing to do is ensure you do not have a common border with Somalia…cross-border poaching expeditions became common. UNEP, CITES, IUCN, TRAFFIC, 2013. Elephants in the Dust – The African Elephant Crisis. A Rapid Response Assessment. United Nations Environment Programme, GRID-Arendal.